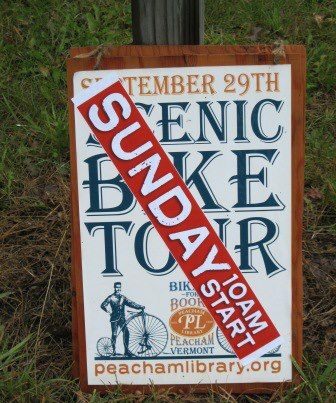 October 7, starting time 10am – noon, Biking For Books, the best 10, 28 or 53 miles you’ll ever ride in support of Peacham Library. Rain last weekend forced the postponement of the ride. We hope this weekend will be nicer! October 12, 10am – noon, Coffee Hour – Join us for a cup of coffee or tea, a sweet or two and good conversation. Suitable for all ages! October 15, 5:15pm, Friends of Peacham Library will meet to plan future events. October 16, 1:15pm, Tuesday Theatre, For thirty years, Albert Nobbs, a woman, has passed as a man in order to work and survive in 19th-century Ireland, but now that life has become a prison. Glenn Close was nominated for Best Actress for her performance as Albert Nobbs. Rated R.
October 19, 9:00am, Preschool Story Time, stories, crafts and activities for the young and their parents. October 20, 4 – 6pm, Artist Reception for Susan McClellan whose oil paintings will go on display October 8. 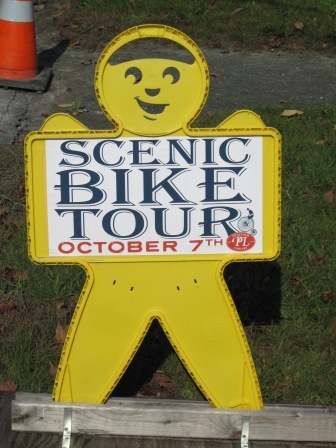 Biking for Books — Sunday, October 7. Start time is between 10am and noon. 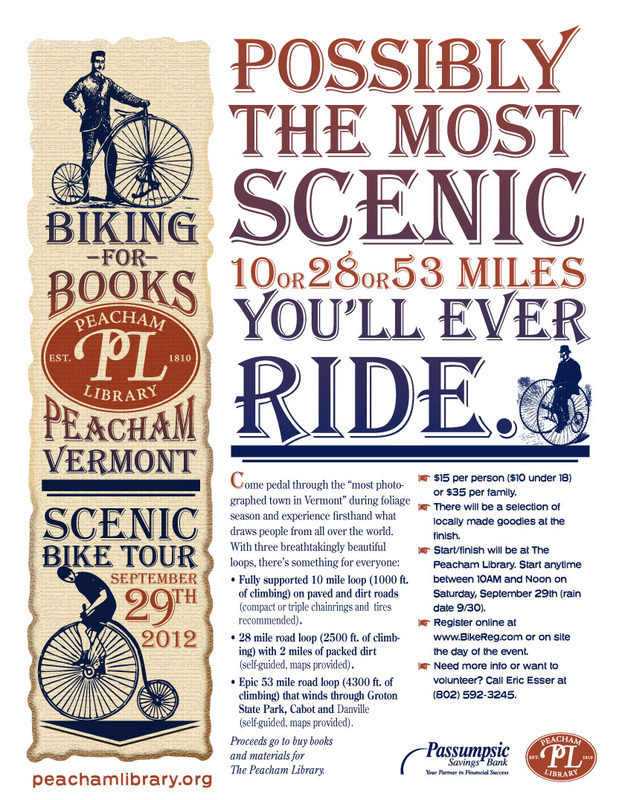 Join us for the best 10, 28 or 53 miles you’ll ever ride. October 4, 9am – 3pm, Fall Foliage Book and Food Sale, stop by early for the best prices on books, and the sweetest treats! Proceeds from the sale support the library and the Friends. October 4, 6:30, Fall Foliage Movie – Peacham becomes Gilead, Maine in this film, starring Ellen Burstyn, about a small town down on its luck. There will be people on hand to tell you about the location of Spitfire Grill, the jail cell, the realtor’s office, and other insider views of the movie. The film is rated PG-13. October 5, 9:00am, Preschool Story Time, stories, crafts and activities for the young and their parents. October 5, 10am – noon, Coffee Hour – Join us for a cup of coffee or tea, a sweet or two and good conversation. Suitable for all ages! Job Opening — Peacham Library is seeking a flexible, friendly Assistant Librarian with excellent communication skills, computer proficiency, basic familiarity with library services, and a willingness to learn. A college degree is desirable. 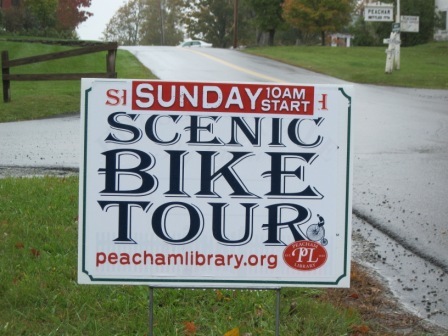 Submit a letter of interest, resume and names of three references by October 5, 2012 to peachamlibrary@gmail.com. More details are given further down this page. September 28, 10am – noon, Coffee Hour – Join us for a cup of coffee or tea, a sweet or two and good conversation. Suitable for all ages! October 5, 9am, Preschool Story Time, a time for parents and children to enjoy stories, free play and a craft. We have new books and DVDs at the library. Checkout this quarter’s list of new books. September 14, 10am – noon, Coffee Hour – Join us for a cup of coffee or tea, a sweet or two and good conversation. Suitable for all ages! September 21, 9:00am, Preschool Story Time, stories, crafts and activities for the young and their parents.